Online, in the cloud. Never any software to download or install. We've all been there. You have notes and information about a show, a collection of digital media assets that need managing, and no time left before show time. 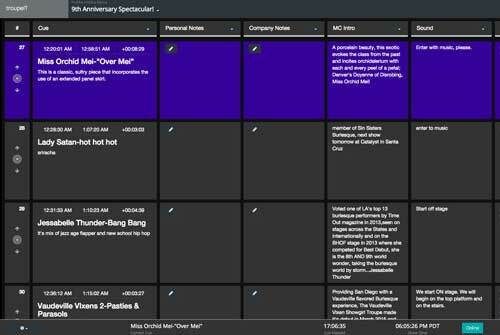 By using TroupeIT, your crew can minimize the time spent managing show details, cues, and assets. Everything lives in a single online service that lets you collaborate with your team to produce a great show. Performers can upload their music and act/presentation while the rest of the team creates, updates, and changes the show schedule as needed. 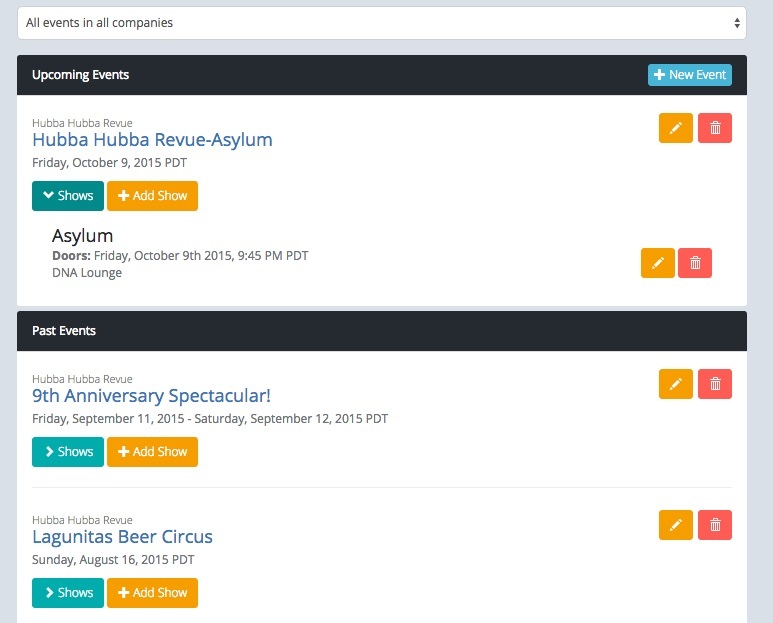 Seamlessly build and edit the same event, together, in real time. Grant simple, easy to understand access roles to your crew members, and give them the information they need to make your show great. Create, update, and change the show schedule while accepting submissions from your performers. Stage managers and performers can manage act details, assets, and cues. See show changes in the cue sheet and edit screens, as they happen. Monitor the show in progress in the customizable real-time console. When changes happen during your show, you know. Cues update in real time, with chat, and notifications. Each crew member can customize the live view to only see the information they need. Eliminate the chance of playing a bad or invalid file. Unlike using CDs or iTunes for playback, we eliminate the chance of you playing the wrong audio file for a performer. After your performers upload their music, and your team has built the show, download the show's information and all associated notes as a single file. 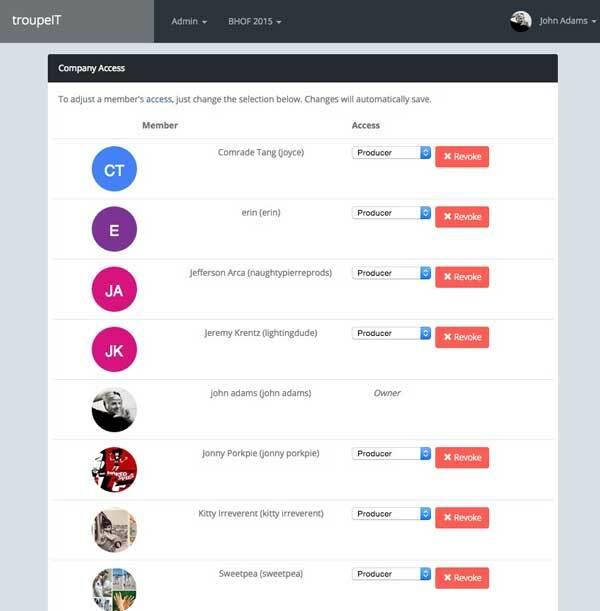 TroupeIT maintains cue order and tells you if any acts are missing media in a pre-show check. Our Sound Check(beta) feature tells you if music is too quiet or low bitrates. We also provide scripts to import the show into popular playback systems like Figure53's Qlab. ... and crafted from experience. 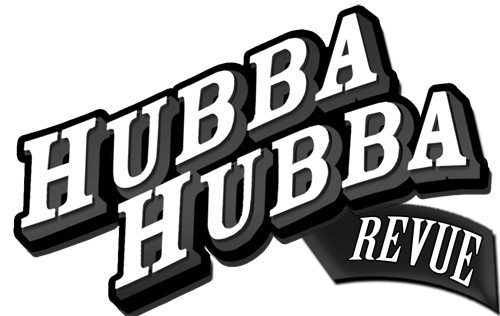 Initially developed to support the monthly performances of a leading San Francisco Burlesque troupe, the Hubba Hubba Revue, TroupeIT has managed more than 600 performers in over 100 performances over three years. Create show schedules and open the show up for submissions. Review and add acts from your performers, and run the show from your mobile device. 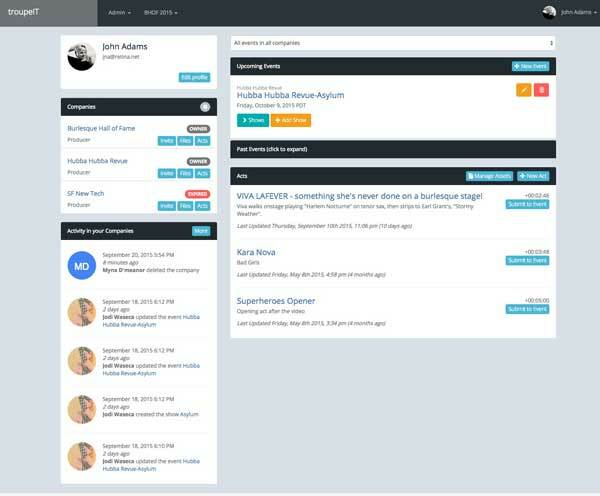 Create and manage your acts with ease and submit them to posted shows. Upload your music or video track and specify your cues and other details to make your performance flawless. 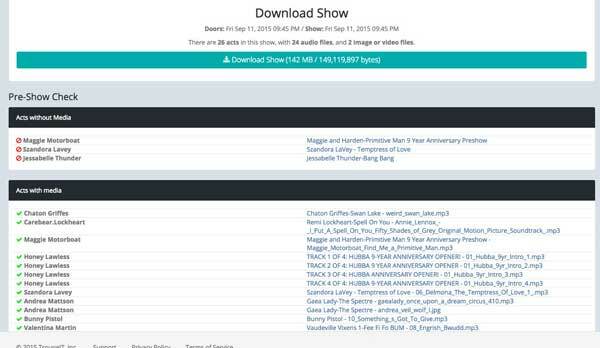 Download the entire show, pre-checked for file types and errors. During the show use the live cue list to track progress in real-time.